Did you make it to the opening party of Siddharta Lounge last Monday? I really should’ve made an effort, gotten dressed up and walked across the bridge. It’s literally a ten minute walk from home and if I peek out of the balcony I could just see it. But… it was one of those days. We did however, make it to this newly revamped lounge at the Grosvenor House Dubai last month, when we could sneak a date with mum here. And of all places, I’m quite happy that we chose Siddharta Lounge to do this much-awaited date. They did a pretty good job with the renovations – with the deck now extending to the other side of the Grosvenor House, overlooking the palm. We were there, date-night – to review the new menu. I had high expectations – I always do when it comes to the Grosvenor House and the Le Royal Meridien. With food and prices – I’ll say that it was reasonably-priced for a fine-dining outlet – considering the place, and location. They serve “coastal mediterranean”, with “asian favourites” – and after speaking to the manager, he explained that long-term guests of the lounge had always requested for food from Buddha Bar (which serves Asian cuisine), so they decided to introduce it in the menu itself over here. Sushi and outdoor lounges will never go wrong. Firstly, portions are generous. 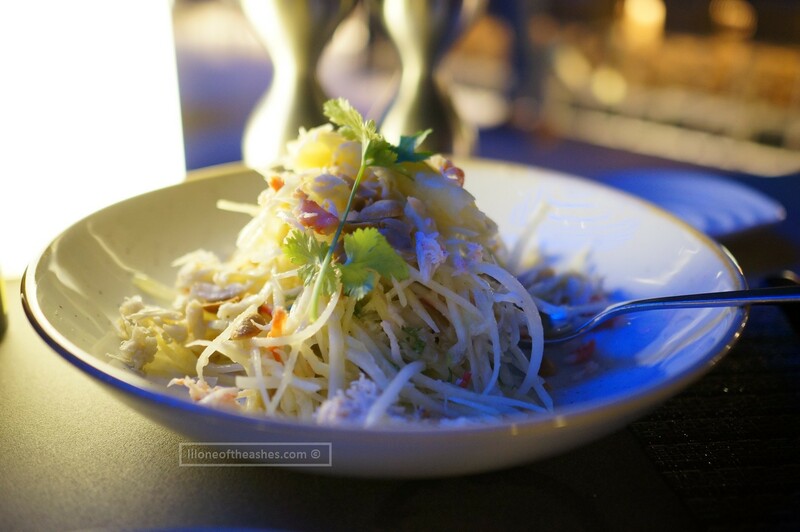 When our starters arrived to the table – mussels mariniere (70 AED), beef tartare (60 AED), and spicy crab and green papaya salad (60 AED) – we both looked at each other thinking – o dear, we’re in trouble. If you were feeling like some seafood, and wanted to order just one thing to share with a date, go for the mussels. We thought they were from New Zealand – as they were so juicy and fat. Not like a lot of mussels we’ve had over here in Dubai (sorry, if you have any other recommendations, please let me know!) From Italy, apparently. Not kiwi mussels, but italian ones are just as good. Simply cooked with white wine, and garlic bread croutons – delicious. Another favourite : the spicy crab and green papaya salad, served with a dash of pineapple dressing and roasted peanuts. This is proper asian spicy so do let them know to tone it down if you can’t take spicy! 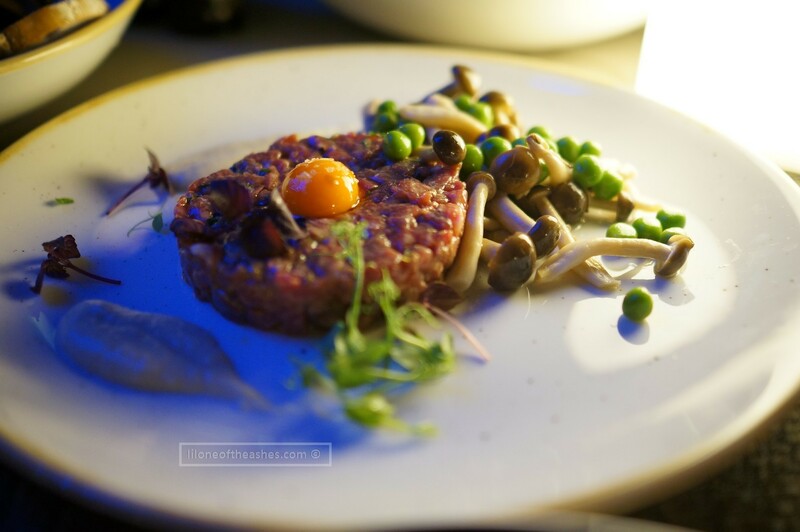 😉 One I would pass when we return is the beef tartare – my own fault as I had thought it to be beef tataki (which they did have in the menu!) – bit too heavy for my liking, served with shimeji mushrooms, topped with quail egg yolk, green peas and shallot sauce. For the main dishes, we went for a selection of sushi, sashimi and the husband wanted some wagyu beef mini burgers (70AED). The spicy tuna roll (80 AED for 8 pieces) however, worked for us – this was put together with asparagus, green tobiko and spring onions. Salmon sashimi, priced at 60 AED for 4 slices is expensive. They did make an effort with presentation – which I’ll give them lots of credit for all their dishes. At the end of the meal, we asked if we could move to the benches overlooking the palm. Perfect end to the evening sipping on cocktails. As much as I had wished to, we couldn’t eat anything else …. so no dessert. Definitely have to return to try what they have to offer. Anything that could be better? No glitches with service, though it is to be noted that this was a review… so I would be curious how they’re like to all other guests (Let me know?). Of the items that we had ordered, I don’t have any complaints – it is an interesting use of ingredients for their sushi (which makes it different to if you were going to casual sushi outlets) – and they definitely got it spot on for presentation. The damage? 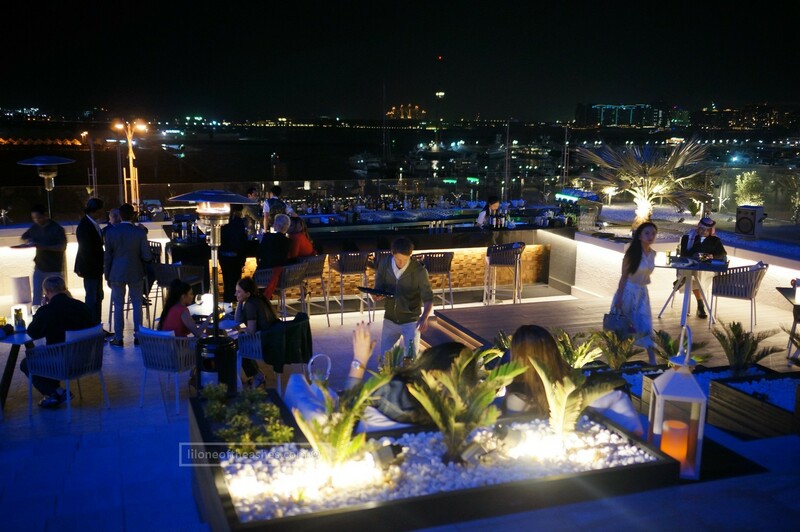 Our dinner would’ve come up to around 500AED for two (excluding drinks) – reasonable, for such a place in the Dubai Marina. On hindsight, we should’ve had just two starters and saved our stomach for dessert. I would recommend it for a date night, or a get-together with friends after work for drinks and food to share. Maybe not when the weather is as it is right now (windy, sand-stormy)…. but definitely get there before real summer hits! Disclaimer : We were guests of Siddharta Lounge to review their menu. Thoughts are our own, though it is entirely up to you to judge. 500AED is certainly reasonable… Glad you and hubby could have a nice night out!